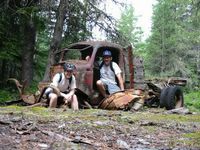 biking around a whistler ghost town, called parkurst. found this beauty of a truck. what woudl the insurance on this be, do you suppose? ?